The Great Basin is a huge heart-shaped area that covers parts of six western United States. Its boundaries depend on how it is defined. Its most common definition is the contiguous watershed, roughly between the Rocky Mountains on the east and the Sierra Nevada and Cascade Mountains on its west, with no natural outlet to the sea. The Great Basin Desert is the largest desert in the United States and is mainly a shrub desert defined by the extent of characteristic plant species, predominantly sagebrush and western juniper, and covers a somewhat different (and smaller) area. The Great Basin Culture Area, home to several Shoshonean Great Basin tribes, extends further to the north and east than the hydrographic basin. The Basin and Range Province is a geologic region that is most recognizable in the Great Basin but extends well into the Sonoran and Mojave Deserts. The 200,000 square mile (520,000 square km) intermontane plateau covers most of Nevada and over half of Utah, as well as parts of California, Idaho, Oregon and Wyoming. Ranges in elevation are from 282 feet (86 m) below sea level in Death Valley to the height of 13,000 feet (3,963 m) at the summit of Mount Wheeler in Eastern Nevada. Throughout the basin, the summers are hot and the winters are cold with an average annual rainfall of just 1.5 inches in Death Valley to 40 inches in the Wasatch Mountains. 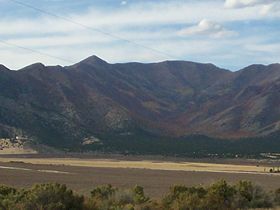 Much of the Great Basin, especially across northern Nevada, consists of a series of isolated mountain ranges and intervening valleys, a geographical configuration known as the Basin and Range Province. Additionally, the Great Basin contains two large expansive playas that are the lakebed remnants of prehistoric lakes that existed in the basin during the last ice age but have since largely dried up. Lake Bonneville extended over most of Western Utah and into Idaho and Nevada, leaving behind the Great Salt Lake, the Bonneville Salt Flats, Utah Lake, and Sevier Lake. Likewise Lake Lahontan extended across much of northwestern Nevada and neighboring states, leaving behind such remnants as the Black Rock Desert, Carson Sink, Humboldt Sink, Walker Lake, Pyramid Lake, Winnemucca Lake, and Honey Lake, each of which now forms a separate watershed within the basin. The Basin and Range Province's dynamic fault history has profoundly affected the region's water drainage system. Most precipitation in the Great Basin falls in the form of snow that melts in the spring. Rain that reaches the ground, or snow that melts, quickly evaporates in the dry desert environment. Some of the water that does not evaporate sinks into the ground to become ground water. The remaining water flows into streams and collects in short-lived lakes called playas on the valley floor and eventually evaporates. Any water that falls as rain or snow into this region does not leave it; not one of the streams that originate within this basin ever finds an outlet to the ocean. The extent of internal drainage, the area in which surface water cannot reach the ocean, defines the geographic region called the Great Basin. The Great Basin's internal drainage results from blockage of water movement by high fault-created mountains and by lack of sufficient water flow to merge with larger drainages outside of the Great Basin. Much of the present-day Great Basin would drain to the sea—just as it did in the recent Ice Ages—if there were more rain and snowfall. Juniper tree forests are found throughout the Great Basin. Mountain ranges separated by valleys are typical in the geography of the Great Basin. The Great Basin is predominantly high altitude desert, with the lowest basins just below 4,000 feet and several peaks over 12,000 feet. Most areas are dominated by shrubs, mostly of the Atriplex genus at the lowest elevations and sagebrush at higher elevations. 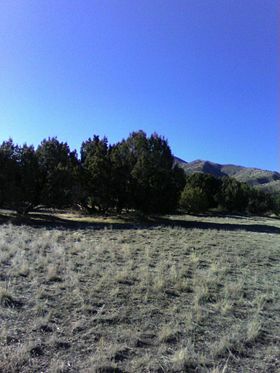 Open woodlands consisting of Utah Juniper, Single-leaf Pinyon (mostly southern areas) or Curl-leaf Mountain Mahogany (mostly northern areas) form on the slopes of most ranges. Stands of Limber Pine and Great Basin Bristlecone Pine can be found in some of the higher ranges. Cottonwoods and Quaking Aspen groves exist in areas with dependable water. Lagomorphs such as Black-tailed Jackrabbit and Desert Cottontail and the coyotes that prey on them are the mammals most often encountered by humans. Ground squirrels are common, but they generally only venture above ground in spring and early summer. Packrats, Kangaroo rats, and other small rodents are also common, but these are predominantly nocturnal. Pronghorn, Mule Deer, and Mountain Lion are also present throughout the area. Elk and Bighorn Sheep are present but uncommon. Small lizards such as the Western fence lizard, Longnose Leopard Lizard and Horned toad are common, especially in lower elevations. Rattlesnakes and Gopher snakes are also present. Shorebirds such as Phalaropes and Curlews can be found in wet areas. American White Pelicans are common at Pyramid Lake. Golden Eagles are perhaps more common in the Great Basin than anywhere else in the United States. Mourning Dove, Western Meadowlark, Black-billed Magpie, and Common Raven are other common bird species. Two endangered species of fish, the Cui-ui sucker fish and the Lahontan cutthroat trout, are found in Pyramid Lake, which is one of the largest lakes in U.S. The salinity is approximately 1/6 of seawater and although it is only 10 percent of the area of the Great Salt Lake, it has about 25 percent more volume. Due to the construction of Derby Dam in 1903 made to divert water to croplands in Fallon, an adjacent town, the Pyramid Cutthroat Trout (a salmon-like trout), became extinct due to the immediate lowered water level, increased water salinity, and lack of fish-ladders on the dam (for upstream spawning runs), and were replaced with Lahontan cutthroat trout from hatcheries. Fish populations are now sustained by several tribally run fish hatcheries. Chukar, Grey Partridge, and Himalayan Snowcock have been successfully introduced to the Great Basin, although the latter has only thrived in the Ruby Mountains. Cheatgrass, which was unintentionally introduced, forms a critical portion of their diets. Mustangs and wild burros are other highly successful, though controversial, alien species. Most of the Great Basin is open range and domestic cattle and sheep are widespread. The Great Basin consists of deep valleys that are separated by high mountain ranges. Oriented lengthwise running north and south, this pattern is repeated continuously; for this reason the area is called the “Basin and Range” country. The Great Basin is considered by geologists to be in the process of stretching and cracking. The earth’s crust and upper mantle has been stretched up to 100% of its original width. Although elevated, the crust here is actually relatively thin, and getting thinner. As the crust is pulled apart, large faults are being created throughout the Great Basin and Range. There is a very high potential for earthquakes to occur due to these active faults. Some geologists speculate that the East Pacific Rise rift zone may be destined in the distant future to split the Great Basin, possibly by way of the Imperial Valley, letting the sea in from the Gulf of California. At the time of the arrival of Europeans, the region was inhabited by a broad group of Uto-Aztecan-speaking Native American tribes known collectively as the Great Basin tribes, including the Shoshone, Ute, and Paiute. Anthropologists use the terms "Desert Archaic" or more simply "The Desert Culture" to refer to the culture of the Great Basin tribes. This culture is characterized by the need for mobility to take advantage of seasonally available food supplies. The use of pottery was rare due to its weight, but intricate baskets were woven for containing water, cooking food, winnowing grass seeds and storage—including the storage of pine nuts, a Paiute-Shoshone staple. Heavy items such as metates would be cached rather than carried from foraging area to foraging area. Agriculture was not practiced within the Great Basin itself, although it was practiced in adjacent areas (modern agriculture in the Great Basin requires either large mountain reservoirs or deep artesian wells). 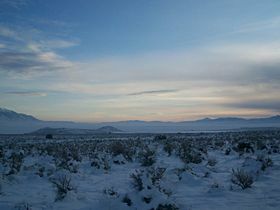 Likewise, the Great Basin tribes had no permanent settlements, although winter villages might be revisited winter after winter by the same group of families. In the summer, the largest group was usually the nuclear family due to the low density of food supplies. The first Europeans to venture into the area were the early Spanish explorers in the southwest in the late 18th century. By the early 19th century, fur trappers from the Hudson's Bay Company had explored the upper Basin in the Oregon Country. The first comprehensive and accurate map of the region was made by John C. Frémont during several expeditions across the region in the 1840s. 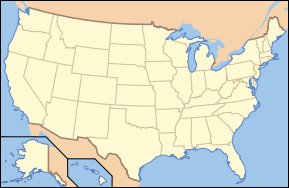 The United States acquired complete control of the area through the 1846 Oregon Treaty (giving it the small portion north of the 42nd parallel) and the 1848 Treaty of Guadalupe Hidalgo. 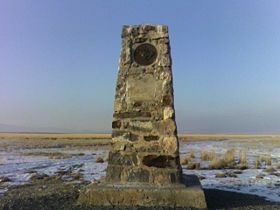 The first large-scale white settlement in the region was by early Mormon pioneers in the late 1840s in the arable areas around Salt Lake City and the Cache Valley. The Mormons quickly established a provisional government and drafted a proposal for a new state called the State of Deseret, that encompassed the entire Great Basin, as well as the coast of southern California. The region became successively organized by the creation of the Oregon Territory in 1848, the admission of California to the Union in 1850, and the creation of the Utah Territory in 1850. The discovery of gold in California, in 1848, brought waves of migrants across the Great Basin along the California Trail, which followed the Humboldt River across Nevada. In 1860-61, the Pony Express came through the area transporting mail from the eastern United States to California. The part of the first North American transcontinental railroad that was built by the Central Pacific railroad crossed the Great Basin between Reno, Nevada, and Ogden, Utah. Another major railroad southwest from Salt Lake City into Nevada led to the founding of Las Vegas, Nevada. In 1986, the Great Basin National Park was established by the Federal Government, encompassing 122 square miles of land in Nevada, near the Utah border. 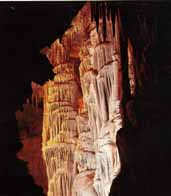 The new National Park subsumed the much smaller Lehman Caves National Monument, which had been established in 1922. All of this land is within the Great Basin, and it includes basin and mountainous land, and is the home of much wildlife. In the 1950s, the area northeast of Las Vegas was the site of numerous above-ground atomic bomb tests, followed in the 1960s by underground testing. The Basin has remained among the most sparsely inhabited areas of the United States. The two largest cities in the basin are Salt Lake City, Utah on its eastern edge and Reno, Nevada on its western edge. Suburbs of Los Angeles, including Lancaster, Palmdale, Victorville and Hesperia combine for about 600,000 residents on the area's southwestern edge. Smaller cities in the basin include Carson City, Winnemucca, and Elko in Nevada; and Ogden, Provo and Logan in Utah. The Great Basin is traversed by major long-distance railroads and expressways, such as the sections of Interstate 80 between Reno and Salt Lake City, Interstate 15 between southwest Utah and Idaho, and Interstate 70 from its junction with Interstate 15 in central Utah from the Great Basin, across the Colorado Plateau to westernmost Colorado. Railroads, such as the Union Pacific and Burlington Northern-Santa Fe connect the major metropolitan areas of Denver, Colorado; Salt Lake City, Utah; Reno, Nevada; and Los Angeles and San Francisco, California. The Great Basin National Park was established in 1986, and is located in east-central Nevada near its border with Utah. The park derives its name from the Great Basin, of which it is a part. The park contains 120.6 mi² (312.3 km²) of land. It is located approximately 290 miles north of Las Vegas, and takes about 5 hours by car from downtown Las Vegas. The park is notable for its groves of ancient bristlecone pines, the oldest known living things, and for the Lehman Caves at the base of Wheeler Peak, which at 13,063 feet is the second highest peak in Nevada. The caves were originally protected on January 24, 1922 as the Lehman Caves National Monument, which was incorporated into the much larger national park. There are a number of developed campsites within the park, as well as excellent backcountry camping opportunities. The park lies in an arid region, and receives very little rainfall during most of the year. Most of the precipitation is received as snow or during summer thunderstorms. Winters are cool and summers are mild to hot. Changes in the weather can occur quickly. Lehman Caves remains near 50°F with 90 percent humidity year-round. The Great Basin is best explored by hiking. The park has 12 trails ranging from 0.3 miles to 13.1 miles. Trails range from short nature trails at 6,825 feet (Mountain View Nature Trail), to the Wheeler Summit Trail starting at 10,160 feet. The Wheeler Summit trail is quite strenuous, and the altitude presents significant hazards for unprepared or inexperienced hikers. Backcountry routes are occasionally maintained throughout the more remote southern portion of the park. A number of these trailheads are accessible by the dirt road that terminates at the primitive Shoshone campground. 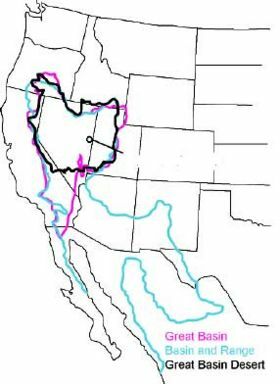 Geologic Provinces of the United States: Basin and Range Province. United States Government Survey. Retrieved April 29, 2007. 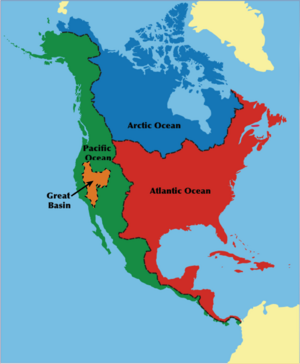 North America Basins Map. United States Government Survey. Retrieved April 29, 2007. Geology of the Great Basin, Science of the Comstock. Retrieved June 20, 2007. Great Basin—Mojave Desert Region. United States Government Survey. Great Basin Shrub Steppe. Bio Images. Great Basin montane forests. Bio Images. Great Basin National Park. National Park Service. Great Basin National Park. U.S. National Parks. This page was last modified on 11 July 2017, at 19:39.